Migration from 10G to 40G is an inevitable trend in data centre. Migration means you need new QSFP+ transceiver modules, fibre patch leads and other equipment. Common two methods to migrate from 10G to 40G for short distance are QSFP+ to 4xSFP+ AOC and QSFP+ MTP breakout cable solution. When you come across this issue, it’s hard to tell which one is better. This article will introduce their difference and tell you how to make the right decision. 40G QSFP+ to 4xSFP+ AOC (active optical cable) is composed of a QSFP+ connector on one side and four individual SFP+ connectors on the other side. 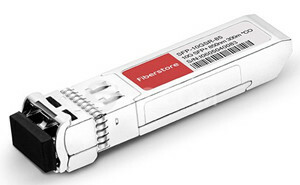 The QSFP+ connector (40Gbps rate) offers four parallel, bidirectional channels and each operates at up to 10.3125 Gbps. The QSFP+ connector can be installed into QSFP+ port on the switch and feed up to four 10G SFP+ links. And the link lengths can reach 100 meters on OM3 fibre. It’s a cost-effective interconnect solution for 40G and 10G switches and servers. The other common solution for 10G to 40G short distance migration is to use MTP breakout cable and of course corresponding transceivers. How to achieve the connection? You’re gonna need 40GBASE-SR4 QSFP+, MTP to LC breakout cable and 10GBASE-SR SFP+. Here we are going to explain 40GBASE-SR4 QSFP+ and MTP breakout cable in details. 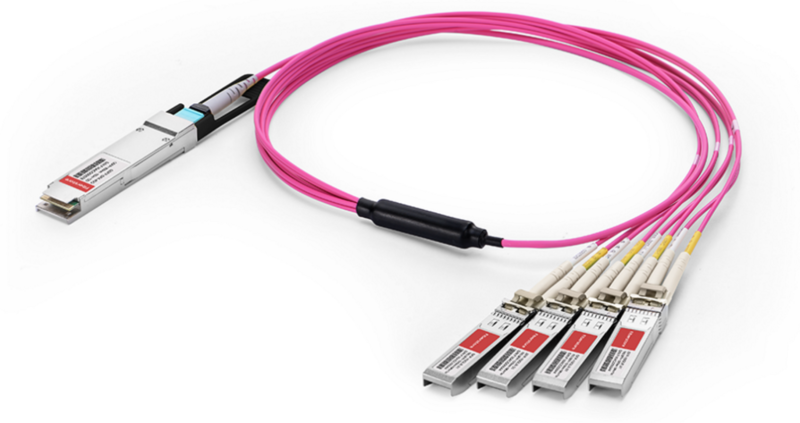 First, 40GBASE-SR4 QSFP+ is designed for 40 Gigabit data centre and can support the link length of 100 m and 150 m respectively on laser optimised OM3 and OM4 fibre cables. This module offers 4 independent channels for transmitting and receiving. Each lane is capable of running 10Gbps signal and is compliant to IEEE 10GBASE-SR specification. Connecting with 12-fibre MTP/MPO cables, it can support 40Gbps network. Or combine 40GBASE-SR4 QSFP+ with 4x10G breakout cable and send data to four 10GBASE-SR SFP+. Second, MTP breakout cable is suitable for high density network. It’s specifically designed for fast Ethernet, fibre channel, data centre and gigabit Ethernet application. QSFP+ MTP breakout cable is used for a direct connection between QSFP+ to 4xSFP+ ports with no patch panels or intermediate trunks in between. On one side, it’s an MTP connector with 8 or 12 fibres. On the other side, there are 4 duplex LC connectors. Each fibre cable transmits 10Gbps. Two methods of 10G to 40G migration over short distance have been introduced in above content. Comparing the two different solutions, you can find some obvious differences. The following lists some points for your convenience to make suitable decision. Price—The second solution needs at one QSFP+, 4 SFP+ and an MTP breakout cable. The price of these devices is higher than 40G QSFP+ to 4xSFP+ AOC. So 40G QSFP+ to 4xSFP+ AOC is cheaper. Complexity—The second solution seems more complicated since it needs more optical equipment. You need to order and manage cables. Distance—40G QSFP+ to 4xSFP+ AOC can only support the distance up to 100 m. While using MTP breakout cable, the link distance can reach 150 m over OM4 cable. You must have a full understanding of these two solutions. 40G QSFP+ to 4xSFP+ AOC is easier and cheaper than MTP breakout cable. If you’re a new technician and have tight budget, you can buy AOC cable. But if you don’t care too much about money, you can select 40GBASE-SR4 QSFP+ and MTP breakout cable to get a little longer link length. Hope this article can help you make the right decision. This entry was posted in Fiber Cabling, Fiber Optic Transceivers and tagged 40GBASE-SR4 QSFP+, QSFP+ MTP breakout cable, QSFP+ to 4xSFP+ AOC on February 24, 2017 by laura.